(August 2, 2012) The Steele Creek Division of the Charlotte-Mecklenburg Police Department will have the public Grand Opening for its new station on Wednesday, September 19 at 2:30 PM. The public will be able to tour the new station and meet with division officers and city officials. 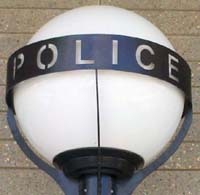 The division is expected to move from its current location at the old Police Academy building on Shopton Road next week. The old station is not visible from the street and sits behind a locked gate in the evenings. The new station sits prominently at the corner of S Tryon Street and Westinghouse Boulevard in the heart of Steele Creek. Although it has an officers' parking lot in the back behind a fence, it also has an accessible public lot on the side and no gate in the front. A sculpture by artist Billy Lee sits in front of the station. The artwork features a tree design cut into circular aluminum plates. The tree represents the center of the community, growth, protection, and stability, and relates to the role of law enforcement to serve and protect. See New Steele Creek Police Station Artwork Design Concept Approved (January 25, 2012). The city has been planning for the station for some time, with the groundbreaking finally occurring last September. The total cost of the new station is approximately $7 million, which includes the building and site design, land purchase, construction, furniture and other equipment, and other professional services. At just under 12,500 square feet, the station will feature a lobby and other public areas, a fitness room, men's and women's locker rooms, a roll call room, various offices, and bull pen areas with officers' work space. The grounds currently are bare, but expect trees and other landscaping to show up during the fall planting season. To see a floorplan and other details, see New Police Station to be Accessible and Environmentally Friendly (March 10, 2011).